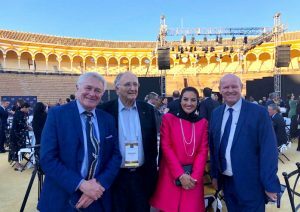 Seville (Spain) — April 9, 2019 (travelindex.com) — The world of tourism has just witnessed the 2019 WTTC Summit (World Travel & Tourism Council), the largest gathering of the tourism industry’s private sector trade in the presence of so many Government Leaders including Barack Obama, the former President of the USA and Margaret Kenyatta, the first Lady of Kenya amongst so many Tourism Ministers coming from the four corners of the world. CEO’s, delegates and ministers that attended the 2-day event last week and everyone said the networking opportunities at WTTC summits was the real value for them to attend such a high profile event. “See and to be seen is the true perk here” the delegates said. At the WTTC Summit Top travel — industry people meet with other top CEO’s in the hallways and coffee shops or hotel suites. Some delegates only attended the opening ceremony and the Obama session but were roaming to shake hands with business partners, ministers and even heads of state. Big business is done this way. It starts often with an exchange of ideas and can trickle down to billion-dollar transactions. The WTTC summit is also the place a CEO can have a cup of coffee with a fellow CEO from a competing company.